'Ghost Wall' By Sarah Moss Review: An Eerie Coming-Of-Age Tale Sarah Moss' beautifully written novel is set in the 1970s in the rugged countryside of the far north of England, where a group of campers are reenacting the daily lives of Iron Age Britons. Last fall, a slim and eerie novel came out in Britain that tells a story about the lingering force of walls. 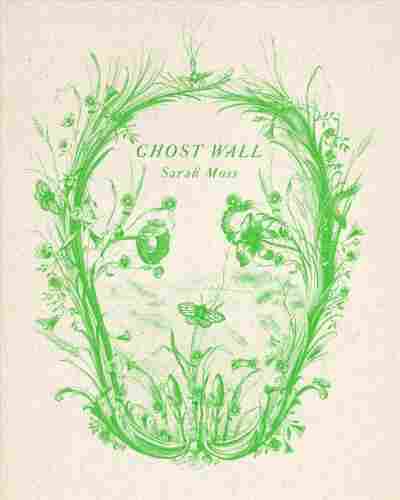 That novel, which has just been published here, is called Ghost Wall, and its author, Sarah Moss, possesses the rare light touch when it comes to melding the uncanny with social commentary. Ghost Wall is set in the 1970s in the rugged countryside of the far north of England. Our narrator is a sheltered 17-year-old girl named Silvie, who has accompanied her parents on a summer field trip of sorts with some university students and their professor. The professor teaches a course in "Experimental Archeology" that requires his students to reenact the daily lives of Iron Age Britons. For two weeks, this small band will forage for roots and berries, capture and skin rabbits, wear scratchy woven tunics and crouch 'round the fire at night. The bog seals around you and it will of course ... fill the inner skins of every orifice, seeping and trickling through the curls of your ears, rising like a tide in your lungs ... it will embalm you from the inside out. Even without such calamities, the northern landscape seems both haunted and hostile to the campers. But the first hint that this is going to be more than just some Outward Bound adventure tale comes when Silvie tells us that she made a failed effort to sleep among the students in order to give her parents some privacy. "Dad didn't want privacy," she says, "he wanted to be able to see what I was up to. ... I did not know what my father thought I might want to do, but he devoted considerable attention to making sure I couldn't do it." Silvie's tone here is cheeky, but it shifts a few pages on, when she glances at her mother and flatly observes, "There was a new bruise on her arm." That's when we readers understand that there's something menacing in her father's surveillance, and that Silvie's deadpan voice is that of a girl who's grown accustomed to domestic violence. Another revelation that slowly gathers force while all these characters are reenacting life in the Iron Age has to do with class. Silvie and her family are working-class — her father is a bus driver; her mother a supermarket cashier. Moreover, her father's fierce, lifelong interest in the world of early Britons stems not from an elite education, but rather from nationalism. Silvie's rather posh French name, for instance, actually derives from Sulevia, a goddess of the Celts and Britons. During a conversation around the campfire with the professor about Roman invasions in the area, Silvie's dad insists that the ancient Britons "put up quite a fight and ... sent them packing in the end, [and] there weren't dark faces in these parts for nigh on two millennia after that, were there?" The professor hesitatingly objects to this racist spin, but as the adventure continues, Iron Age attitudes, particularly relating to gender, begin to predominate. The women are told to forage and cook while the men bond over "kill[ing] things." When the men announce that they've decided to build a "ghost wall" — a magical fortification topped with skulls that ancient Britons erected as a "defense against the Romans" — it's clear they've gone off the deep end in terms of channeling the patriarchal tribal past. It also seems clear that the women, as usual, will suffer the consequences of these fantasies. Ghost Wall is such a weird and distinctive story: It could be labeled a supernatural tale, a coming-of-age chronicle, even a timely meditation on the various meanings of walls themselves. All this, packed into a beautifully written story of 130 pages. No wonder I read it twice within one week.